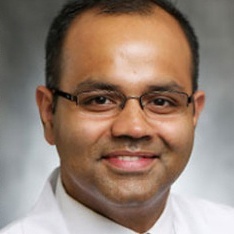 Dr. Kiran Turaga is an expert in the HIPEC procedure for peritoneal mesothelioma patients at the University of Chicago Comprehensive Cancer Center. Surgical oncologist Dr. Kiran Turaga treats a range of abdominal and peritoneal diseases, including mesothelioma. Turaga joined the mesothelioma program at the University of Chicago in 2016 after six years at the Medical College of Wisconsin Cancer Center, where he carved a reputation as a leading specialist in the field of asbestos-related disease. Turaga was named director of the Surgical GI Cancer Program and the Regional Therapeutics Program in Chicago. He has expertise in hyperthermic intraperitoneal chemotherapy (HIPEC), which is used in conjunction with cytoreductive surgery for peritoneal mesothelioma. HIPEC, which is only used in select cancer centers, is designed to deliver high doses of heated chemotherapy directly to the abdominal organs to kill any tumor cells that evaded surgical removal. Turaga also has expertise in innovative robotic surgery, which is minimally invasive and promotes quicker recovery times for patients. Turaga has a special interest in treating advanced malignancies, including cancers that have spread beyond their original sites. He works on colon cancer, appendix cancer and malignant bowel obstructions. He works closely with Dr. Hedy Kindler, director of the mesothelioma program at the University of Chicago. Both are part of the collaborative tumor board that meets regularly at the cancer center to discuss each mesothelioma patient. Turaga completed fellowships at the Moffitt Cancer Center in Tampa and the University of Pittsburgh Medical Center. Both hospitals are known for their work with mesothelioma patients. He graduated from the All India Institute of Medical Sciences in New Delhi and completed his residency at Creighton University Medical Center. He has published more than 100 peer-reviewed articles, including one in the Annals of Surgical Oncology that detailed the high percentage of mesothelioma patients who unknowingly bypassed surgical options that could have significantly extended their survival. Disclaimer: Dr. Kiran Turaga has no professional affiliation with Asbestos.com.